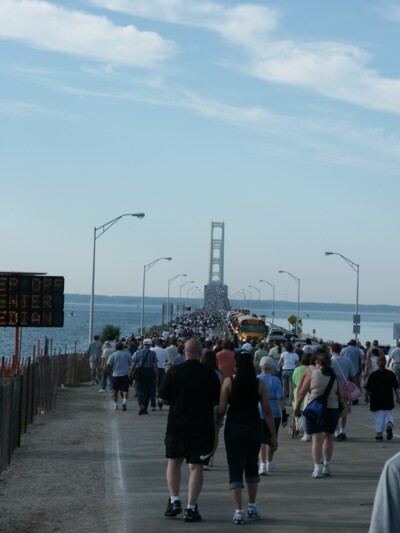 Welcome to the start of the 51st annual Mackinac Bridge Walk. Wow…the bridge looks really far away in this shot. In fact, when we were bused over I kept thinking the whole way as we slowly creeped along, “Woah..this is one long bridge. I mean, we’ve been driving over it for five minutes now and we haven’t even gotten to the bridge proper. Ima gonna die!” Of course traffic was unusually slow because they had narrowed it down to one lane each way (usually there are two north and two south lanes) so the walkers could walk. You are currently browsing the Booniverse weblog archives for the day Monday, September 1st, 2008.